When I first dove into the high-end makeup pool I spent a lot of careless money on products that just didn't work for me. From foundations that cost a pretty penny to mascaras that just didn't work for me, I could have definitely used a guide to help me along the way. I picked products that aren't over the top for this starter kit. The base is light and the colors neutral and simple. A starter kit should ease the transition into a new category rather than shock the system and make you never want to try anything new. I love the Stile One Step Correct so much it had to be the primer of choice. It kind of acts like a moisturizer as well as a setup for makeup and I love how hydrating it feels on the skin when I wear nothing but it. Moderation is key with this product though because you can run out of it quick if you aren't careful. For base there are literally tons of options in the high-end makeup world, but if you're just starting out something on the lighter side is best so you aren't finding yourself with a seriously heavy foundation and no idea what to do with it. The bareMinerals Complexion Rescue has a mousse-like texture that blends out easily and lightly on the skin with any tool (sponge, brush, or fingers). Plus it's not nearly as expensive as most of the other foundation options and the shades are pretty forgiving if you go for the wrong one. The NARS Creamy Concealer is a great choice if you're looking for something light to medium coverage that doesn't slip around or crease. It's definitely not the most coverage, but can be built up and worked with for desired effect. Brows are not a high priority if you're just getting into makeup, but if you do by chance want to give it a whirl nothing beats the Anastasia Brow Wiz. It has a spoolie built in and a small little nib so you don't have to worry about making a huge mess on your brows. If you're looking for a solid brush that won't let you down I'm sure you already know about Tarte's options. Pick one that's good for all occasions and you'll never need another one. You can explore a lot more when it comes to eye shadow. A lot of the luxury brands have very similar shades in consistency and pigmentation, but if you want to buy one palette and be set for years, Urban Decay is your promised land. Pick up one of the Naked palettes and you won't need anything else. Mascara is the trickiest of the high end products because a lot of drugstore brands are just as good if not better at it. If you are looking to splurge and try something though anything by Lancome is good and Marc Jacobs also really brings it. 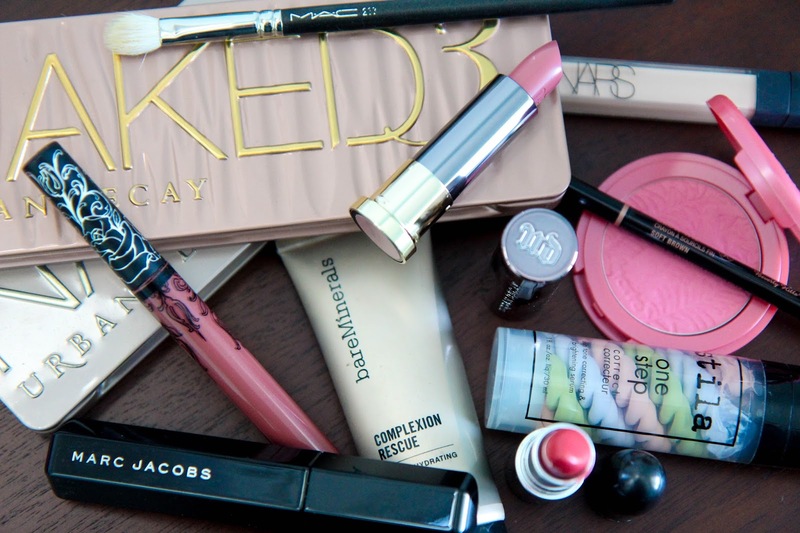 Lipsticks is another category that you really can't lose for high-end makeup. Almost all the brands produce high quality lipsticks that last, but I always gravitate back to MAC if I want just a basic, solid lipstick. Urban Decay will be releasing their new VICE collection with a lot of great color options. For liquid lipstick Kat Von D's Everlasting Liquid Lipsticks have some funky shade options, but the consistency and lasting power can't be beat. Now if you want to step up your tool game, Real Techniques is a good middle of the road option, but I can't help but reach for MAC ones. They're definitely higher end on the brush ladder, but my MAC 217 is my most used brush as it really packs on the product and eliminates a lot of fallout issues. If you are interested in getting into the more expensive, luxury side of makeup, definitely don't be like me. Do your research and carefully select products you think will work for you and what you've enjoyed from drugstore makeup. Take your time with it and enjoy feeling pampered and fabulous every time you put on makeup.